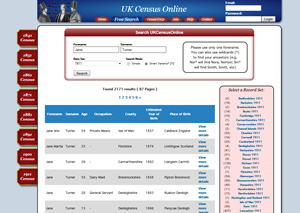 After 1837, marriage records are easily searchable and the best way to view them is online through services like the subscription sites UKCensusOnline.com and TheGenealogist.co.uk or credit based sites like BMDindex.co.uk. These online services provide searchable records with a user-friendly interface and subscription services give you unlimited searches. Use the free search box opposite to look for the marriages of your ancestors. There is also the option of creating a surname map, a feature at both BMDindex.co.uk and TheGenealogist - you simply type in a surname and year, and it will give you the places where people with a particular surname lived at that time. You can search transcripts of the marriages at TheGenealogist.co.uk. They have added these records to a new tool that lets you search across all their Birth, Marriage and Death transcripts with built in SmartSearch technology, automatically showing partners full name where available, and enabling you find potential parents from a birth, potential children to a marriage and potential birth records from a death record. Marriage Records before 1837 are only available in Parish Registers. This is because BMD records have only been kept by law since 1837. Parish Records give you baptism, marriage and burial information. Parish Records were started in 1538 - a law was passed that ordered each clergyman to record baptisms, marriages and burials in the prescence of a Churchwarden. These records were kept in a book in the church - today, they are kept in a County Record Office. However, since archivists are reluctant to allow handling of these old and unique books, it is advised you view the records on CD-ROM or online - this will not only save you time, but the records are searchable so you can find the person you are looking for in seconds rather than going through an old book which could take hours. Which website shall I use? TheGenealogist is a vast online research site. Whether you are a beginner and have a lot of research to do or are already an experienced family historian, TheGenealogist offers more resources and better value-for-money in the long-term. Find out more at www.thegenealogist.co.uk. 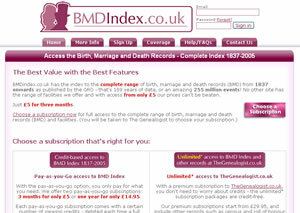 BMDindex.co.uk has the index to the complete range of birth, marriage and death records (BMD) from 1837 onwards as published by the GRO - that's 169 years of data, or an amazing 255 million events! Access from only £5. 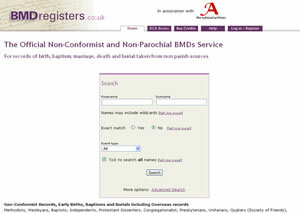 The Official Non-Conformist and Non-Parochial BMDs Service, in association with The National Archives. For records of birth, baptism, marriage, death and burial taken from non parish sources. 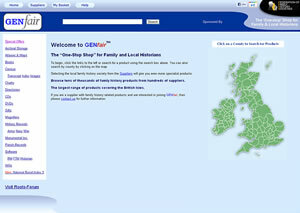 UK Genealogy supplies and Family History site offering products including UK genealogy software, storage products, data CDs (census, parish records, directories and more), books and charts. The “One-Stop Shop” for Family and Local Historians. 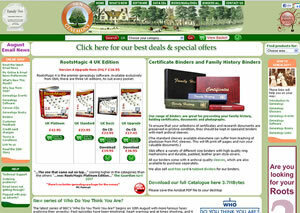 Browse tens of thousands of family history products from hundreds of suppliers.